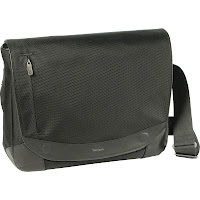 If you are looking for a great bag to protect and easily carry your laptop, you have got to check out Targus and their great selection of laptop bags - especially their Hughes Laptop Messenger! The Targus Hughes Laptop Messenger is designed to fit laptops with up to 15.6” screens. For convenience, the case features a quick access front pocket which is scratch-resistant to help protect items that could get damaged easily. The interior features two large storage compartments for accessories, documents and more and also includes pen loops and a scratch-resistant mobile phone compartment. A back slip pocket provides convenient storage for magazines or files and the front magnetic closure is quiet and easy to use. The messenger features curved, ergonomic zipper pulls that are easy to grip and feel comfortable to maneuver. For added durability the case bottom and is constructed of industry-grade tarpaulin which is water-and-wear resistant. The bottom of the padded/adjustable shoulder strap is also covered in tarpaulin to provide a non-slip surface for comfortable carrying. Constructed of nylon material with premium leather accents, this case utilizes top-grade materials to integrate a sophisticated style with the functionality of a day to day executive case. Targus is helping me take care of my laptop with their amazing Hughes Laptop Messenger Bag. I love that my laptop fits comfortably in the bag so that I don't have to struggle getting the laptop in and out (especially while going through security at the airport - that is the WORST!). I have had that problem in the past with other laptop bags! This bag is for any frequent traveler, business person or just for the casual laptop lover who just wants to protect their "baby". This bag is durable and easy to carry and won't hold you up at security at the airport! Buy It: You can purchase the Targus Hughes Laptop Messenger for $119.99 on the Targus website.